Good Monday morning! I spent last week hopping from one event to the next, or maybe I should say one meal to the next, so blogging fell by the wayside. Real life before online life, right? Eat dessert before you write about dessert-ha! Lots of fun and too many treats, but I'm pretty sure that's the way December is meant to be. December is the month of indulgence and January is the month of no pain, no gain, but we won't think about that today. They're candy cane snowballs (recipe here) and they are yummy! I'm normally not a huge mint lover but these are not overpowering and the cookie itself is delicious. The candy cane pieces get a little melty gooey and who doesn't like that? Plus, they are so pretty and I like a variety of colors and flavors on my cookie tray. I took these to a party at a friend's house where we had a fun gift exchange. I ended up with a set of four Christmas wine glasses which hubs and I broke in over the weekend. I know I just said mint isn't my favorite flavor, but this popcorn is so good. It's coated in melted white chocolate mixed with crushed candy canes and is the perfect combination of sweet and salty deliciousness that no one can resist. You'll find the recipe here. I bagged it up in pretty cello packages and gave it away as part of my 12 Days of Christmas Kindness. I made bags for my neighbors and handed them out at a neighborhood dinner last Thursday, and I also took bags into my dry cleaners because they're always so nice and go out of their way to accommodate us when we need something done yesterday. I also took bags into the post office because I gotta tell ya, our clerks are a tad on the cranky side and I thought this would bring a smile. It did. It's a way to share the Christmas story using chocolate, which just so happens to be his love language. You'll find the poem here. Last Friday our Gourmet Group met for a holiday gathering and our theme was holiday appetizers and desserts. We're assigned recipes and mine was Spiced Coffee. It was scrumptious and I will definitely serve this again. It's so simple-brew a pot of coffee (8 cups) and then put it in your crockpot. Add 1/3 cup of sugar, 1/4 cup of chocolate syrup, and 1/2 tsp anise extract. 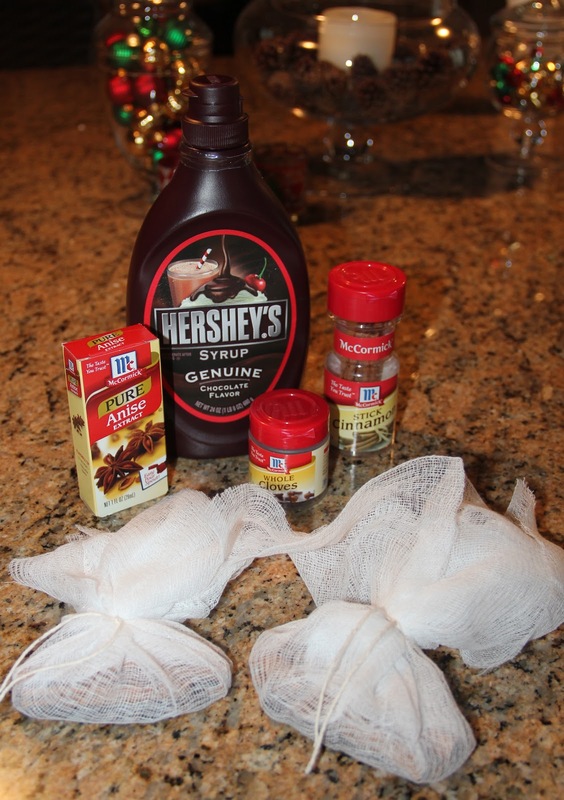 Tie up four cinnamon sticks and 1 1/2 tsp cloves in some cheesecloth and add it to the pot. Let simmer on low for 2-3 hours. I doubled the recipe without any trouble. 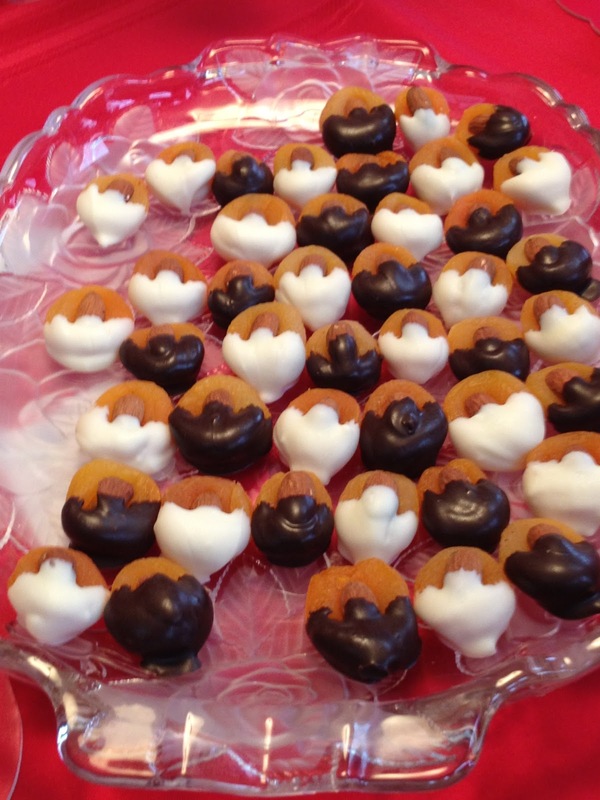 All you do is press an almond into a dried apricot and then dip one end into melted white and dark chocolate. Easy peasy. Would mine look this perfect? Hmmm...doubtful, but I'm gonna try. Our Gourmet Group also had a fun gift exchange. Everyone brought a gently used kitchen item wrapped and I ended up with a Paula Deen cookbook so I was happy. On Saturday I finally sat down and put together a craft I'd been wanting to try. We get a lot of photo cards and I wanted to display them somehow. My card holder stacks the cards so you really don't get to enjoy the photos as much as you'd like. I'd seen this Christmas card garland on Pinterest and it seemed simple enough even for me-Miss Not Crafty. I'm also Miss Not a Photographer. In my defense it was dark when I took the picture so I'll snap another once I get it hung. I think it turned out so cute! I covered a whole package of clothespins with the scrapbook paper, but obviously I won't display this many cards on the ribbon. They'd be too jammed and defeat the purpose of being able to see the photos, but this way I have extras if any break. You'll find the instructions for the Christmas card garland here. Finally, on Sunday afternoon I dipped the buttercreams. These are tradition in our house and it is not officially Christmas until this tedious job is done. I was really missing Daughter2 yesterday since she is my official dipper and doesn't run out of patience before the job is done. Patience is key, and if you rush the job you end up with sloppy tops. I may have one or two sloppy tops. Santa won't care...he loves buttercreams. WOW Joyce you have been busy baking and crafting! I go to Pinterest pin things but never make anything! In the new year I think that will be a resolution! Joyce, everything looks sooo yummy and you've inspired me to get going on our treats here! 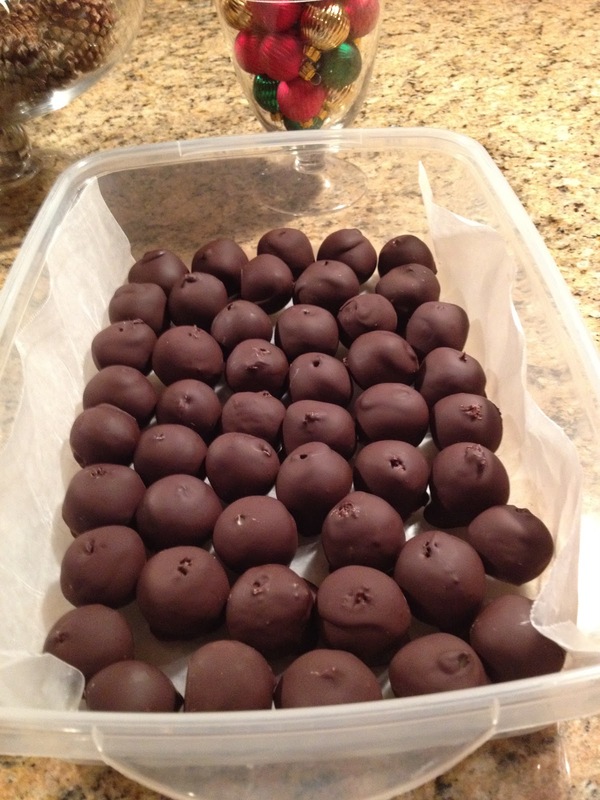 Your buttercreams look like the buckeyes we make with a peanut buttercream filling. Love the mint popcorn idea and may just have to try that. And I think more than just Santa will love those buttercreams! Enjoy the season! I think I gained a couple of those Christmas pounds just reading this post. I am very tempted to try the candy cane snowballs. OK...I definitely have to hop on the treadmill after reading this, Joyce! Goodness through and through! Do you know that I've never had a buttercream before? Shameful, isn't it? Everything looks wonderful! I like the Christmas Garland. I plan on making it. It will be a great way to display photo Christmas cards. Thanks for sharing. WOW you have been busy with all sort of things. I will now have to go walk on the treadmill to work off the weight. Thank you. Joyce....my jaw dropped at all these wonderful treats. You have been very busy. I hope to do some treats next week. I love the clothespins. I cheated and bought some from Coldwater Creek but someday I will make some like you! Oh my stars at all the sweet goodness! I LOVE the idea of a Gourmet group, sounds like too much fun! Ooh, we've been crafting around here too, but I haven't gotten the pics off the camera yet. That's always a hurdle for me. I'm going to have to try the Spiced Coffee, that sounds like my kind of drink. Keep enjoying this Christmas season! Ohhh seeing all of your goodies makes me want to get started on mine, only I have to wait until we go to Arkansas. I do not do very much in the kitchen here. It just doesn't feel like my kitchen, his niece Patt does all the cooking. Which is okay but is hard at the same time. Oh well... My grandkids can help me when I am in Arkansas. Okay, I'm trying not to eat anything sweet tonight and you show me all these wonderful desserts! lol Everything looks so good and maybe even easy enough for me to do. Love the Christmas photo holder. The coffee and garland really appeal to me. Gotta say the buttercreams do, too. Go, you! i made candy cane snowballs last year... they were so good! You are my hero! Everything looks amazing, Joyce. Oh my, Joyce, you've been busy making all sorts of yummy and fun things. I definitely printed off a couple of the ideas you mentioned mostly having to do with peppermint. :) Thank you for sharing.